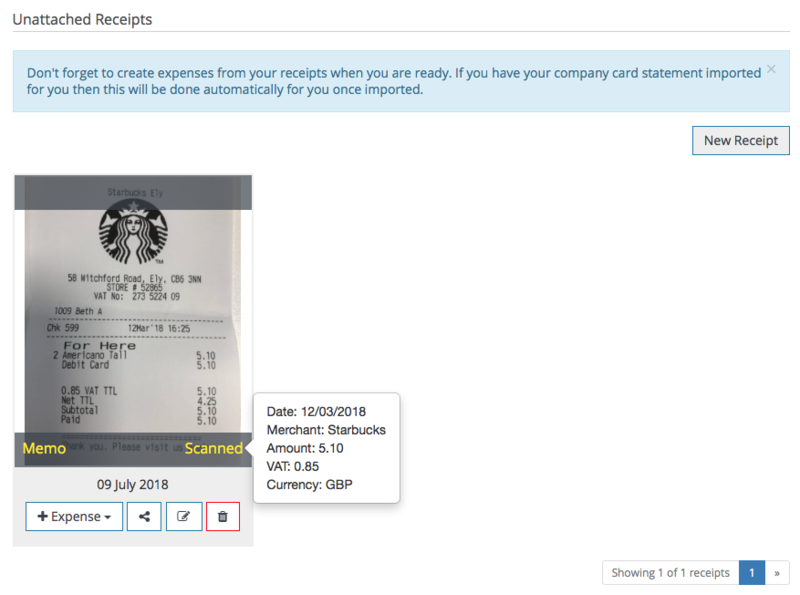 You can capture a receipt via the web-portal and create an expense from it. Creating expenses from your receipts is easy. You will just need to ensure that your receipt is stored on your computer. 2. 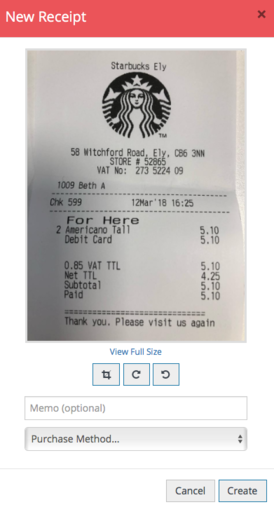 Click Choose a receipt and browse your computer for the receipt you wish to upload. 3. We would recommend adding a memo to your receipt as this will populate the description box when you create the expense. 4. You can choose the Purchase Method of the expense. Click Create to add that receipt to your account! Please note: If you have any receipts that have been sent to your email address, you will want to check out our email-to-receipts feature to get those receipts sent to your account. The receipt will now be sent to your Unattached Receipts section. You can create an expense instantly but we would suggest waiting for the receipt to be scanned first. The scanning process will extract the Date, Merchant, Amount, VAT amount and Currency. This process takes approximately one minute. Once a receipt has been scanned it will have a yellow scanned label on it. You can now create an expense from that receipt by clicking the Expense button. Please note: If your finance team upload card statements on your behalf, do not create expenses from these receipts as you will create duplicates. See the company card import article for more information on the card process. Now that you have captured your receipts you can create expenses from them.